I had the pleasure of teaching one of my favourite classes today. I teach an undergraduate module called “Human Resource Ecology”. It’s all about humans and how they interact with the environment and looks at issues of how humans subsist and where conflicts arise. Today’s session was a lecture about the Bushmeat trade followed by a seminar on human-wildlife conflict. The lecture is always interesting – it throws up some really interesting questions about the sustainability of bushmeat for communities that rely upon it. It also reminds the students that it’s not all about remote populations of hunter-gatherers but that actually bushmeat can form a major part of the economy in many Central and West-african countries. People often forget that bushmeat hunting and trade brings not only food to hunter-gathering communities but also can bring money too. In fact studies have shown it can account for up to 90% of household income in parts of Cameroon. It’s not just the local communities that benefit though, taxi drivers who transport the meat to markets and market traders also benefit. Bushmeat is a luxury food item in many parts of Africa so it can be a lucrative trade. However it’s pretty much impossible for bushmeat to be sustainable and if you care about wildlife conservation, which I do, then it’s very hard to defend. People have to eat but the majority of the bushmeat trade revolves around hunters and urban dwellers who do not rely on bushmeat as a food source and have plenty of other options. 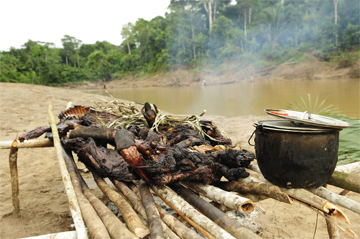 Bushmeat can only support a maximum of 1 person per square km of tropical forest. In most places population densities are far higher than that now so it’s only a matter of time until bushmeat supplies i.e. wild animal species, are hunted to extinction. This is a topic I’ll be exploring with my students in more detail in a couple of weeks time and it always stimulates excellent debate as it’s such an emotive issue. If you want to find out more – check out the UK Bushmeat Working Group. The seminar part of today’s class was the really fun bit (at least in my humble opinion – and the students seem to enjoy it too…). I get them to think about a specific issue of human-wildlife conflict – that of carnivores and people and we do a bit of a role play debate. 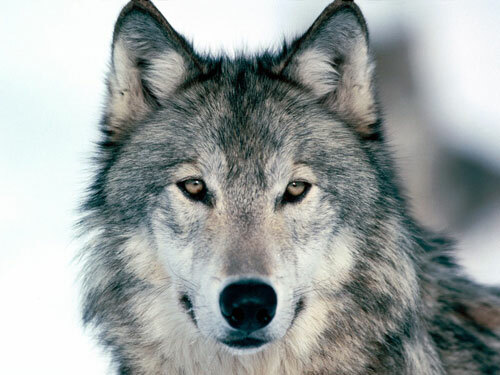 The issue is the re-introduction of wolves to Scotland and the students are split into groups of the 3 main stakeholders – the NGO/charity who want to reintroduce the wolves, the local sheep farmers living in the area, and the local community. We then stage a “community meeting” where the NGO have to present their proposal to the local farmers and community. It’s such fun and really gets students thinking about the issues. Today was no exception. A fab group of students really got in to their roles – discussing the pro’s and con’s of such a scheme and how it might impact on local communities and livelihoods. It’s a great way to get everyone engaged, sharing ideas and thinking about all the issues that surround these sorts of situations. It’s not such a crazy idea either. The idea of reintroducing wolves to Scotland has been raised a number of times (you can read more here). It’s been argued that introducing wolves to Scotland again (where they’ve been extinct since the 1700’s) would help to control Red Deer numbers. Red Deer are very destructive to the native pine forests and currently expensive culling programmes are used to control them – wolves, it’s proposed, could do this job for free. Naturally though there are serious concerns from local farmers who are woried that their sheep would become prey for the wolves, and from local people who feel the safety of their children and pets would be at risk. Reintroduction of wolves is a long way off becoming reality, but other species reintroductions have taken place already – such as wild boar and beaver in parts of the UK so it’s certainly something that could happen and it will be extremely interesting to see how it develops.